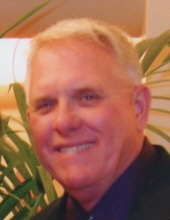 Gerald Lee “Jerry” Klahn, age 74, of Plymouth, went home to be with the Lord on February 3, 2019. He was born on December 6, 1944 in Plymouth, son of the late Clarence and Irene (Brandt) Klahn. He was baptized at St. John Lutheran Church in Plymouth and attended Valley Grade School. He graduated from Plymouth High School in 1963. Jerry was on his family farm for 30 years. He was then employed by Plymouth Sand and Gravel, later went to Gilson for 16 years, and his last job was working 19 years at DFA (Borden’s), retiring in 2009. On October 5, 1985, he married Sharon J. Geosits at their home. The couple has resided in the Town of Plymouth since their marriage. Jerry attended Grace Lutheran Church in Elkhart Lake. He was a very talented man. He loved working in the garage on his tractors and making furniture. Jerry also loved going up north to the cabin that he and Sharon built in Fence, WI, and loved all the people he met up there. He also enjoyed going on road trips, visiting with friends, riding his Harley, but most of all he loved spending time with his children and grandchildren. Survivors include: Wife: Sharon of Plymouth; Two children: Brian Klahn of Virginia and Steven (Heather) Klahn of Sheboygan Falls; Two step children: Bart (Michelle) Epping of Oostburg and Monica (Brian) Entringer of Plymouth; Seven grandchildren: Ellianna, Nathan, Logan, Mackenna, Emily, Mason, and Avery; and Brother-in-law: Larry Geosits of Sheboygan Falls. Jerry was preceded in death by his parents: Clarence and Irene, and Father and Mother-in-law: John and Delores Geosits. Following Jerry’s wishes, cremation has taken place and Memorial Services will be held on Friday (February 8, 2019) at Grace Lutheran Church in Elkhart Lake. Visitation will take place from 10:00 A.M. – 12:00 Noon, with services to follow at 12:00 Noon. Rev. Peter Peitsch, Pastor of the Church will officiate. Inurnment will be in the Plymouth Woodlawn Cemetery. In lieu of flowers, memorials are suggested in Jerry’s name to Grace Lutheran Church in Elkhart Lake. To send flowers or a remembrance gift to the family of Gerald L. Klahn, please visit our Tribute Store. "Email Address" would like to share the life celebration of Gerald L. Klahn. Click on the "link" to go to share a favorite memory or leave a condolence message for the family.